The analyses specifically examined each country's electricity, transportation, heating/cooling, industrial, and agriculture/forestry/fishing sectors. Of the 139 countries—selected because they were countries for which data were publically available from the International Energy Agency and collectively emit over 99% of all carbon dioxide worldwide—the places the study showed that had a greater share of land per population (e.g., the United States, China, the European Union) are projected to have the easiest time making the transition to 100% wind, water, and solar. Another learning was that the most difficult places to transition may be highly populated, very small countries surrounded by lots of ocean, such as Singapore, which may require an investment in offshore solar to convert fully. The Joule paper is an expansion of 2015 roadmaps to transition each of the 50 United States to 100% clean, renewable energy (DOI: 10.1039/C5EE01283J) and an analysis of whether the electric grid can stay stable upon such a transition (DOI: 10.1073/pnas.1510028112). Not only does this new study cover nearly the entire world, there are also improved calculations on the availability of rooftop solar energy, renewable energy resources, and jobs created versus lost. All that at cost of ruination of natural landscapes, ruination of wildlife habitats, annihilation of millions of birds and other endangered species. That is, if we gather wind energy with actual turbines. What if there was something less deadly for birds but still efficient, is not even better? And regarding Solar and Water energy....it's not impossible to get that without "ruination of natual lanscape, wildlife habitats, annihilations of millions of birds (oops, not that one) and other endangered species. And anger of the wild Willies. That, we may want to avoid at almost all costs. 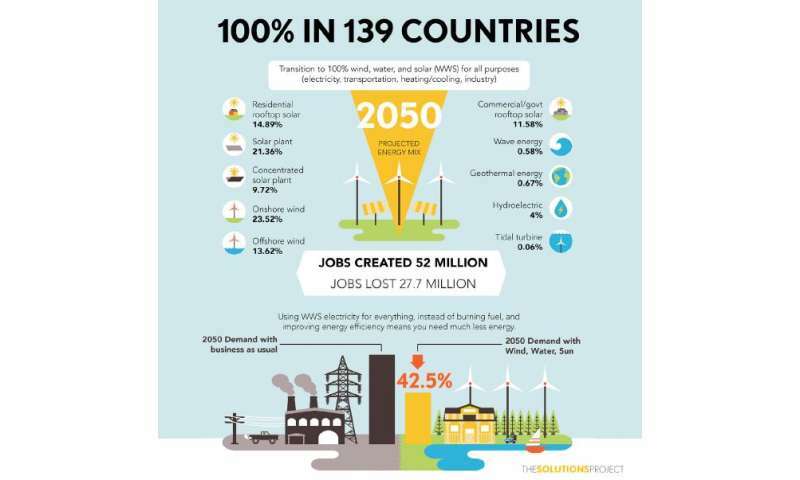 "It appears we can achieve the enormous social benefits of a zero-emission energy system at essentially no extra cost,"
That's what coal/uranium mining, oil drilling, fracking, burning of fossil fuels (in powerplants and vehicles) does to a much greater extent...your point? It's sorta ludicrous how you keep repeating the same BS while advocating stuff that does it all - just to a much greater extent. Double standard much? Solutions are obtained by prioritizing storage for heat (in soil and water); cold (in ice and water); and electricity (in phase-change materials, pumped hydro, hydropower, and hydrogen), and using demand response. Heat and cold storage are obvious, but pumped hydro and hydropower have their own ecological impact, GHG impact (methane emissions), and safety hazards (dams failures). The hydrogen economy is something of a pipe dream as the fuel is hard to produce and handle economically and safely, and "demand response" basically translates to energy rationing (for the poor, the rich can always buy it). The models' data also assumes that the overall output of WWS is the same year after year, so it has no provision or stockpiles for energy security. Especially for the space shuttle and electric planes argument: that's a massive handwave over the issue. There's a reason why a space rocket has miles wide exclusion zone around the launchpad, and airplane companies aren't even dreaming of flying electric jumbo jets across the continent - at the present they're looking at electric boosters for takeoff to save fuel because jets are terribly inefficient at low speeds. Same problem with the cars. H2 is an unsafe fuel with piss-poor energy density, and the tech to use it is massively expensive. If it's going to get any use it has to be reformed into some dense liquid that is storable at room temperature, like methanol, to make any sense. Eco-nuts believe materials for renewables do not needed be mined, i.e. appear by magic. Eco-nuts believe all that will be manufactured/mined/transported/installed/recycled by wind/solar-powered machines. Unlike Eco-nuts, fossil fuel barons seem to understand energy physics it's why they support renewables. And WillieTard believes that the changeover to renewables will somehow be accompanied by a never ending AND ever increasing demand for more materials, too deeply moron to understand that once the infrastructure is built, demand for additional material decreases sharply, as additional material is only needed for maintenance(when it can't be recycled) or to add new capacity. All while virtually eliminating fuel extraction/refining/transportation cost and associated pollution. Uhhh... most of the enormous social benefits were achieved long ago thanks to coal and petroleum. They are what fueled industrial revolutions around the globe which drastically improved the quality of life of billions of people; lighting and heating their homes, providing transportation, mobility and automation that vastly increased the efficiency of agricultural production. Any additional "social benefits" of renewable energy above what has already been achieved are incomparably small. Moving to unreliable and intermittent energy production is in fact turning the clock back a couple centuries. Until renewables become as reliable and energy-dense as fossil fuels their role will be relegated to supplemental energy production only. Utter nonsense. Claims of "air pollution deaths" are based on statistical malpractice that projects deaths from the insinuated secondary effects of particulate pollution that presumably exacerbates chronic lung conditions and shortens lives. In contrast, thousands die each year in poor countries from the real, direct effects of indoor air pollution in the form of soot and carbon monoxide from burning wood and cattle dung. Solar and wind power actually destabilize energy prices due to their intermittent production. It is reliable "base load" power from coal, natural gas and nuclear fission that stabilizes energy prices. And now they are starting to decrease the quality of life. As long as the garbarge heap wasn't too big no one noticed. Now that we're constantly breathing that garbage and it's affecting our climate it's time to do something about it. Any additional "social benefits" of renewable energy above what has already been achieved are incomparably small. I would file "survival of the human race" under a lot of things. "Small" is not one of them. As the article points out: It needs not be unreliable or intermittent if deployed with adequate backup. Plenty of studies show how much is needed to get grid stability as good as we have today. Why would you call Willie as a brown chestnut? Excuse me but did I miss the section where they talk about viable energy storage for these intermittent sources of power? Heat storage in rocks looks to be very inefficient. 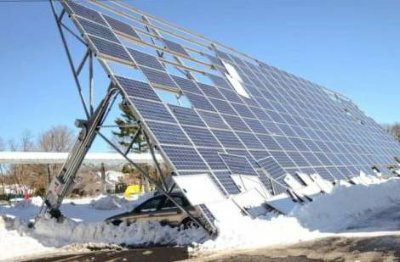 Greentards believe that a solar panel, or a wind turbine, generates enough energy to recycle or manufacture another solar panel, or another wind turbine, or a set of batteries, although in practice it's happening nowhere. "Wind might be renewable, but wind turbines are not." "Sunlight may be renewable, but solar panels are not." "Big growth in wind energy, but what about the waste? The 16,000 tonnes *per year* are "huge problem," say Germans." And now they are starting to decrease the quality of life. In what way are fossil fuels and nuclear power starting to decrease quality of life? The U.S. EPA tracks air and water quality and the trend for the last 25 to 35 years shows continued improvement in air quality and water quality. In places like Beijing and in developing countries, pollution is a problem that they will solve in time. The U.S. and other post-industrial, wealthy nations, manage pollution and waste just fine and continue to do it better each year. The future's so bright, we gotta wear shades. Unfortunately the alarmists don't see it that way; but some people aren't happy unless they're gloomy about something. WillieTard believes that renewables can't produce enough power to recycle wind and solar equipment components. Well --that's WillieTard, all day, every day. Willietard-- is fossil fuel capable of recycling an offshore drilling platform? How about a coal mine? A gas or oil pipeline? Nice photo of a damaged solar assembly. Here is a panel of leading climate scientists—James Hansen, Tom Wigley, Kerry Emanuel, and Ken Caldeira—politely criticizing Mark Jacobson's earlier report outlining a 100% renewable energy future for the U.S. They are at a conference promoting nuclear power, which they recognize as the cleanest, safest, most efficient, reliable large-scale power production technology developed so far and an important component to reducing carbon dioxide emissions. Jacobson's U.S. plan, based on "unrealistic assumptions" as his colleague at Stanford, Ken Caldeira says, has now been extended to 138 other countries and is no more realistic. 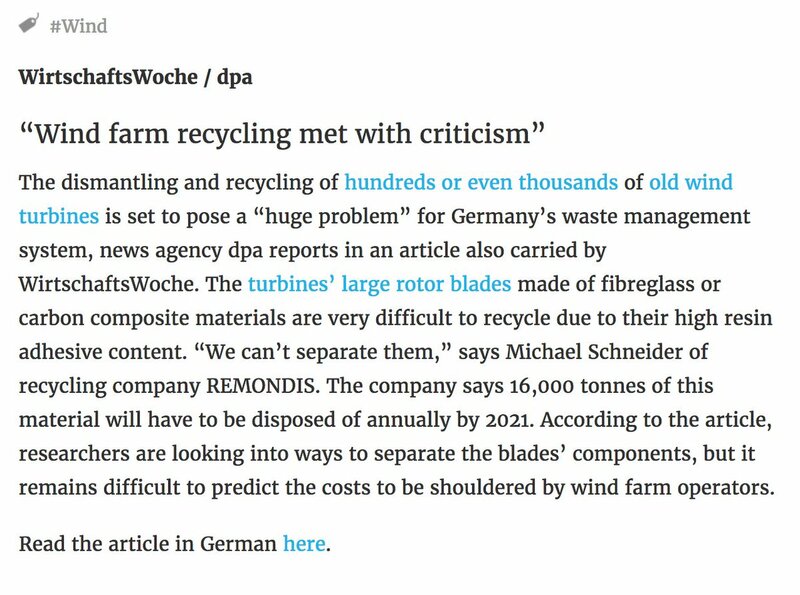 An article detailing the difficulties of recycling wind turbine blades. Excellent. Now that the problem has been identified, it would appear to not be insurmountable. Maybe some engineering and material science people can develop a better, recyclable, blade? OK, then --instead, think about all the $$$ that would be in it for you, Amirite? 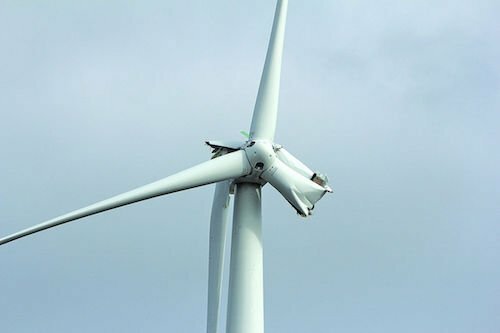 Finally, Willietard's second linked article discusses the DECREASING costs of incorporating renewable energy into the grid. You're really on a streak, here, WillieTard --one that closely resembles the streak in the trolldiaper that swaths your spotted trollbottom. In what way are fossil fuels and nuclear power starting to decrease quality of life? They champion energy production that is reliable, sustainable, and environmentally friendly. Though I disagree with their views on global warming, it is interesting to hear their realistic approach to reducing carbon emissions which contrasts sharply with Mark Jacobson's. Sacbag again displays a talent for IMPUTATION. Three of the panel offer some criticisms. None reject it. 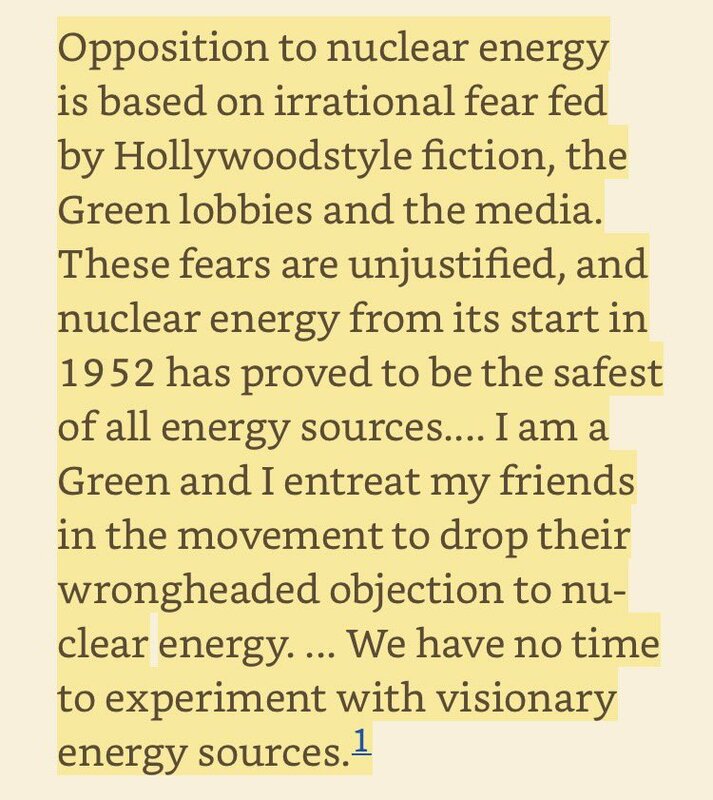 Only one makes an outright endorsement of Nuke, after first citing its historic death/KWH safety record, well known to utterly ignore any and all effects on health not directly linked to power generation, and power generation only. The same holds true for the claimed cost/KWH trope. Hansen says nothing on either issue. One suspects that this video segment was edited to present only those comments that appeared to support nuke and cast doubt upon the feasability of Jacobson's proposition. Taken so far out of context, we don't even really know what the individual panelist's views are with regard to Nuclear, or what their intent was impaneling for this conference. Luckily for us, sacbag has kindly provided ITS context. The best part is that their only real objection appears to be Jacobson's reliance upon stored hydro to back up intermittent supply of renewables. I agree with that criticism. Fortunately, it's a problem that has already been solved, as there are currently several grid-scale back up storage systems available. This development has occurred since the COP 21 conference, which was HELD IN 2015.
sacbag, exposed once again as peddler of disinformation, hell-bent on preventing any solution to AGW. -There is no evidence that carbon emissions from fossil fuels are contributing significantly to climate change. There simply is no way to accurately measure it. The approximately 1° C of increase since the late 1800's falls within the range of natural variability. Note that at the EPA air quality trends page that pollution from sulfur dioxide and nitrogen dioxide, which supposedly causes acid rain, continue to decline. View the whole thing if you'd like context. These are leading climate scientists speaking at an international climate summit. They're all true believers that humans are causing global warming, but Hansen, to his credit, thinks nuclear power is a valid solution. Why are these fossil fuel people against jobs? Do they WANT to make more people unemployed? there are currently several grid-scale back up storage systems available. This development has occurred since the COP 21 conference, which was HELD IN 2015. They've always been available, even before 2015. They're just not economically feasible. Three of the panel offer some criticisms. None reject it. if you make unrealistic assumptions you can end up with unrealistic conclusions and I think that's what Mark Jacobson has done. -There is no evidence that carbon emissions from fossil fuels are contributing significantly to climate change, SAYS SACBAG. YET THOUSANDS OF SCIENTISTS DISAGREE WITH THIS LONE MAROON, There simply is no way to accurately measure it. The approximately(IOW, WELL OVER) 1° C of increase since the late 1800's falls within the range of natural variability.SAYS SACBAG, AGAIN- THOUSANDS OF SCIENTISTS DISAGREE WITH THIS LONE MAROON. SACBAG: NOTE THAT THE DECLINING TREND IN SO2/NO2 POLLUTION FOLLOWS THE SIGNING INTO LAW OF THE CLEAN AIR ACT, WAY BACK IN THE 1970S. Four trillions of dollars already spent on wind/solar unicorn fantasy. Greentards are celebrating, believing 100% is possible no matter economical/ecological costs. "The share of electricity production from renewables has barely increased between 1990 and 2014 (from 19% to 21%)" most is hydro and biomass. Greentards will never understand: (installed capacity ≠ energy produced)! Everything else though - fully agree. Greentards/Eco-nuts have no alternative except continue to lie to themselves and insult others that expose their cognitive dissonance and double standards. Lamentable!
" "Nuclear will make the difference between the world missing crucial climate targets or achieving them"
You need to produce the source from which your "quote" is taken, so that we can determine the context in which the statement(as you claim, unattributed) was supposedly made. Beyond that, to claim --much less believe-- that nuclear can be deployed any faster, cheaper, or more universally is complete gas. As we all know, the chief difficulty in replacing fossil fuels is in terms of automotive/transport fuels and lubricants. Given that 99.99999999999999999999999999999999999999999999% of all modes of transport operate on fossil fuels, it will take some time to replace them with electrically-powered units, and will obviously require some coordination, legislation, and incentives. It will take money, before anything. People won't buy what they can't buy. It's actually the case. 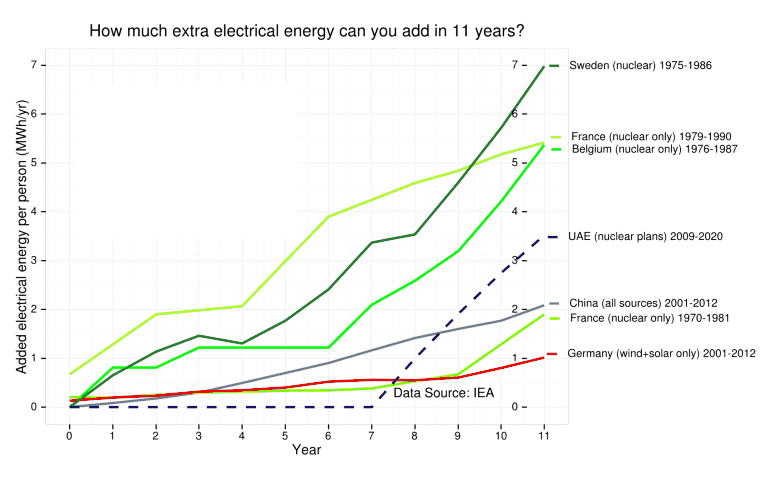 Projections on how much EV there'll be in the (not so far) future in the world are delusional. But public transports could and should quickly be converted. In few years, they'll probably be the norm. - Four trillions of dollars spent for almost nothing in terms of CO2 reduction. In conclusion, intermittent renewables will be remembered as the most expensive scam of the history. The future is carbon-free nuclear power, a proven decarbonization method, our only hope to save the planet from Climate Change and from ruination of natural landscapes, disruption of wildlife habitats, annihilation of millions of birds and other species by wind/solar (bird-choppers/landscape-destroyers) and hydro dams. 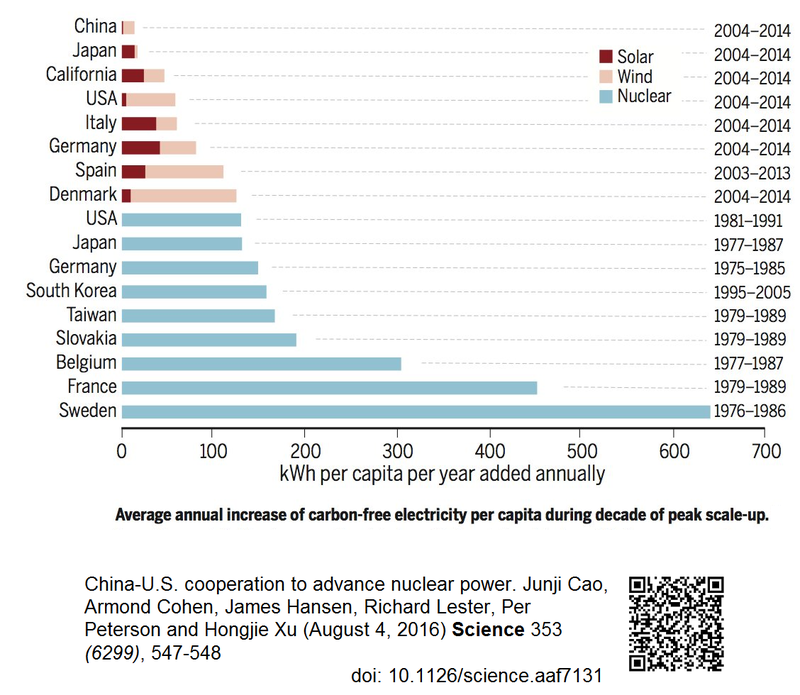 Carbon-free nuclear was already deployed cheap and fast, e.g. 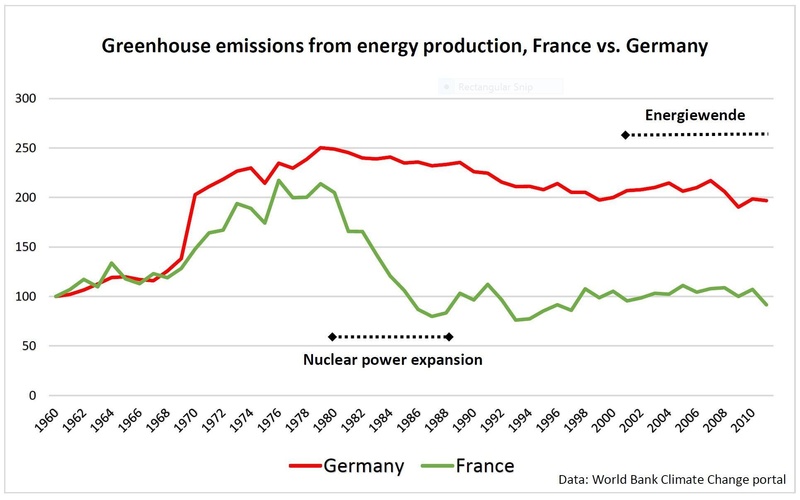 France; it's a proven method of curbing CO2 emissions and is the only scaleable way to decarbonize modern grids, hydro resources are limited. 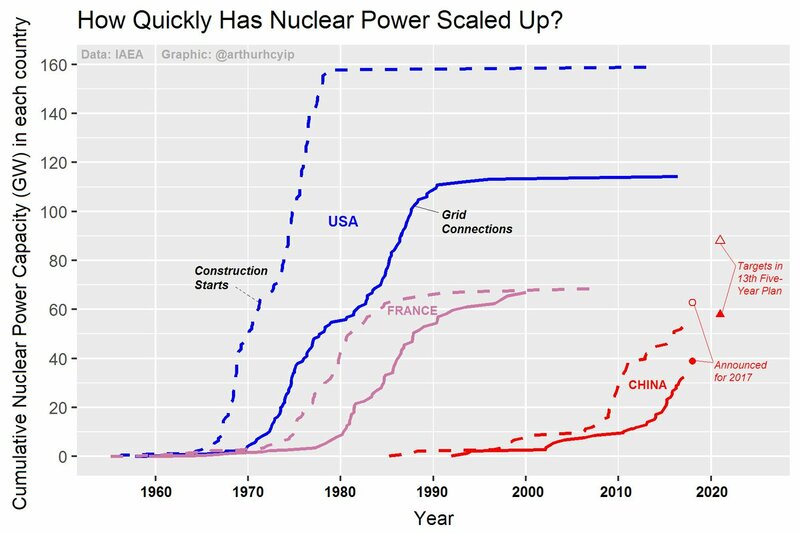 "The mantra 'nuclear can't be done quickly enough...' is...mostly just taken as true, while the data prove the exact opposite." Nuclear power can be used to produce hydrogen, methanol, ammonia and other carbon-free/low-carbon synthetic fuels. "Nuclear power can be used to produce hydrogen, methanol, ammonia and other carbon-free/low-carbon synthetic fuels." Well, sure, Willie, if we could afford it. And were not concerned about more meltdowns. Remember when the nukers told us they could not happen? And then when it happened, it could not go all the way down. Then, when that happened, it was championed as better than remewables, because they could run it flat-out for lots'a juice before it destroyed itself. Sorry, Willie, you used up all the money for nukes. Now, you have to dig up another $980,000,000,000 for the "clean up" of Fukushima. It is a myth, a mantra used by faux-greens to favor the fossil fuels(backup for intermittent renewables) which air pollution respects no border and kills millions of people every year. Fukushima and Three Mile Island resulted in zero deaths from radiation exposure, and even including Chernobyl with the worst projected(not-confirmed) scenario, carbon-free nuclear power is the safest per unit of energy produced, fewer fatalities and less ecological impacts than renewables. The elevated cost of "clean up" is due to exaggeration caused by antinuclear/pro-fossil-fuels feamongers, people are exposed to more radiation during a commercial flight(up to 65 mSv) than in Fukushima(20 mSv). This thread has long since ceased to have anything at all to do with the proposal of the good Doctor and now is merely a forum for trollery. The facts are straightforward: the only weakness of this plan is the call to use hydro as a backup. Therefore, I will --ONCE AGAIN-- point out that the OBVIOUS SOLUTION --grid-scale battery backup-- is already available. Everything else is just so much gas being generated out of blind devotion to nuclear, or blind, IDIOT devotion to denierside ideology. This one even addresses @Eikka's pet bugaboo, grid stability. But he's still against it. First @Eikka claims it can't be done, then when it's done @Eikka whines about the technique, totally ignoring the fact that if there's one such solution there are many. There always were. Me, I'm an "all of the above" kinda guy. There are lots of solutions, and when it gets hot enough we'll be using them all. The earlier we start exploring them, the better. antialias asked "But...but...but...profit?" According to the South Park gnomes, profit will come from underpants, though I think they are missing a step somewhere.